So, on cool spring weekends I like to make scones in all its earthy goodness, but on hot sunny Sundays it's time for fruit crepes! These whip up quite quickly, and are great with a side of sweet potato hashbrowns with herbs. 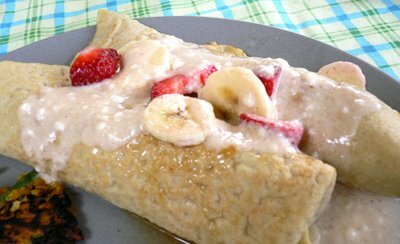 Pictured here using spelt flour, filled with bananas and strawberries and drizzled with honey orange yogurt sauce. Makes 4 crepes (serves 2). In a bowl, beat the eggs and mix in the olive oil, vanilla, milk and water using a hand whisk. Mix in the flour, salt and cinnamon. Heat a non-stick pan to medium-high heat and spray with olive oil. Use a 1/4 cup measuring cup to ladle the batter onto the center of the pan, and swirl the pan around gently to coat the pan evenly with the batter. Cook a minute then flip and cook a minute longer. The crepes should be pale with hints of golden toastiness. To assemble, spoon some fruit and berries in a row down the center of each crepe. Drizzle some yogurt sauce down the row. Roll the crepe (tucking in the sides if you like a tidy package, or just leave open on the sides). Top with some more fruits and another drizzle of yogurt sauce. If you like, garnish with some toasted almonds, walnuts or grated coconut! 3 Researches PROVE How Coconut Oil Kills Waist Fat. This means that you literally get rid of fat by consuming coconut fat (in addition to coconut milk, coconut cream and coconut oil).